Discussion in 'The War at Sea' started by Ferguson73uk, Feb 18, 2009. I have discovered that a number of other Royal Marines and naval personnel died on the same day. The unit text for each is H.M.L.C.F. 1. Am I right in thinking that this was a landing craft of some type? Quite right, although it was a conversion for support. A lesson learnt at Crete was the need for special anti-aircraft landing craft. Two LCT(2)s were accordingly converted to prototype LCFs and were respectively armed with heavy and light AA guns. LCF1 was a most formidable craft armed with two 4″ twin mountings, while LCF2 adopted a light AA armament of eight 2 pounder guns and four 20mm Oerlikons. 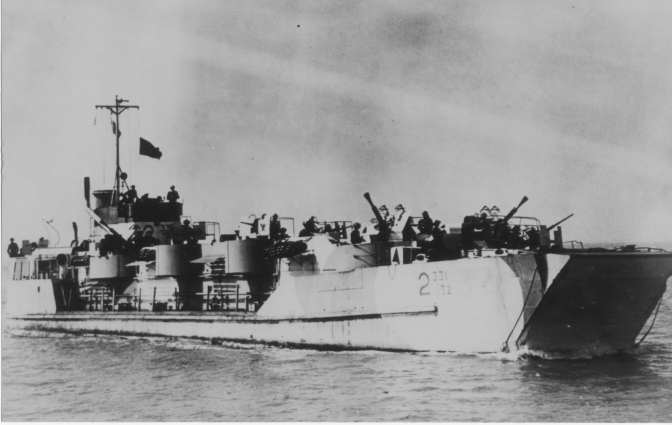 The Landing Craft Flak were the first of the support craft, and the only Royal Navy Warship Class to have a German name - Flak being the German for anti-aircraft. By June 1942, six of the LCFs were in service, but the design of LCF1 was not repeated, all LCFs except LCF1 carried light anti-aircraft guns. A total of 46 LCFs were converted. His Majesty's Landing Craft Flak (Large) No.1. was taking part in Operation NEPTUNE, the cross-channel operations involved in the D-Day landings (Operation Overlord), when it blew up and sank. Perhaps it hit a mine? An officer who died is buried in Southampton Cemetery, one of the Marines in Hermanville and the rest are commemorated on the Portsmouth and Chatham Memorials. Your men were on Landing craft flak (MkII) LCF (500-550 tons) No.1. She blew up and sank, Operation Neptune, Normandy Landings, N France, August 17, 1944. Looking at the date I would guess they were crewing here moored off the coast providing a AA defence off either Sword or Gold beaches. Floating Flak platforms were located on the flanks of the Gooseberry shelters just off the shore line in about 2 fathoms of water. Further more I would suggest that at the time of her sinking (17th Aug) the Allied Navy would have cleared the area of any remaing mines. The only two other reasons I can think of are either a air attack or a on board accident. Seeing as her loss is listed as 'Blew up and Sank' I'd go for the later option. I think your men would have died in the explosion or as a result of wounds received. There were at that time somewhere in excess of 20 ships of all types within the Gooseberry Shelters so if they were in the water I would have thought they would have been saved. Your welcome, I couldn't find a lot of info but what I have is above with some guess work thrown in to help put it all together so some of it is just my opinion. Anyhow, I will copy and paste the section to this thread. Looks like they were part of S.S.E.F. or Support Squadron Eastern Flank. Basically set up to defend from E Boats, One Man subs, Enemy mine laying etc. As Le Havre was still operational, lots of enemy forays against the allies east flank. How do I paste it to a thread and not as an attachment. Then it will be easier to read!! As there are 15 pages in this chapter, I'll just post page 242 which confirms that LCF1 was part of the SSEF operations on the allied east flank on the night of Aug 9 and 10. There is no mention of the loss of this particular craft. Page 242 - Try again. There is mention that this squadron lost 4 craft between June 24th & September 11th after which it ceased operations. 2 LCG (Landing Craft Gun) both mined and sunk. One LCG sunk by an explosive motor boat and One LCF (Landing Craft Flak) torpedoed and sunk. As page 242 confirms LCF1 operated in this area and only one was lost, it must be presumed this was their fate. Cost in Personnnel to this flotilla were 8 officers and 57 men killed or missing and 3 officers and 112 men wounded. Le Havre had fallen to the British 49th & 51st Division, thus removing the threat from this port. Scroll down to Landing Craft Flak and it states LCF1 blew up and sank 17/9/44. At least the book says how. Andy - Just joking - Page 243 as requested. I said this book was interesting. At least the book says how. Does it or have I missed that bit? You edited a post ! The ban applied to land based LAA as well. Too many friendly fire incidents. There is a document in my Dad's war diary with correspondence between the CO and someone else (an argument with whom I can't remember). A battery of my Dad's regiment actually shot down an RCAF Typoon straffing allied troops in error and blew it out of the sky. Page 247 of the book with the sinking assumption. That must be her fate then Rob because there was only one LCF lost at Normandy around that time.